I said yesterday that I get the impression Daniel Abraham is not as impressed with truth and honesty as most people say they are. He almost seems to be saying there are times when it is better to suppress the truth and lie to the public, if it results in better outcomes. It even looks like he’s saying that the Freedom to Lie is an important one, and to take that away from people is to destroy a portion of our free will. Daniel Abraham does look to be saying in these books that outcomes are more important than intentions. Geder is good-hearted and personally likable. He simply wants to be shown some basic human respect and left to read his speculative fiction/essays. His intentions are relatable and if not “good”, at least not blameworthy. And yet despite his good character and innocent intent he commits atrocities – nuking a city, giving power to foreign cultists, and starting a war of conquest. Dawson’s intentions are honorable. He wants stability and order. For the law to be upheld and honor be served. He is strong-hearted and firm, even if he is a bit of an elitist prick. He is basically a good person. And yet his actions lead to a devastating civil war that almost tears his kingdom apart. Both are cases of good intentions, but bad outcomes. The Priests of the Goddess, on the other hand… they are painted as evil. They’re religious fanatics from the desert. They want to convert everyone and bring the world under the rule of their goddess. They worship a giant bug. 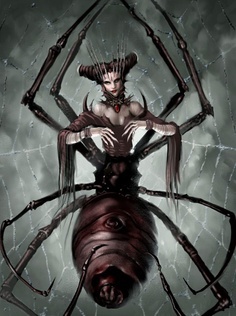 They have spiders living in their blood – their flesh is literally corrupt. But what are their outcomes? They abolish falsehood and deceit wherever they go. They want to unite the world to put an end to all war. All we’ve seen them do in the narrative so far is A) reveal when others are lying, and B) use their powers as weapons of warfare – which anyone involved in a war would do… and which saved lives when employed! If Dawson hadn’t had been so stubborn they could have ended the siege in a matter of days, saving the lives of soldiers as well as preventing the death by disease and starvation of hundreds (thousands?) of serfs and peasants! Oh, and I guess they’re also hunting for a heretic that is trying to undermine them and kill their goddess, but you can’t fault them for that.